May 16, 2018 -- Radiology leaders must take the lead in educating the imaging community about how artificial intelligence (AI) will augment the work of radiologists rather than take away their jobs, said RSNA President Dr. Vijay Rao at the recent Canadian Association of Radiologists (CAR) meeting in Montreal. The onus is on radiology leaders to inform their colleagues, practicing radiologists, residents, and students about AI and how the technology can be harnessed to ease the workload of radiologists as well as enhance patient care, Rao said during a talk in late April at CAR 2018. 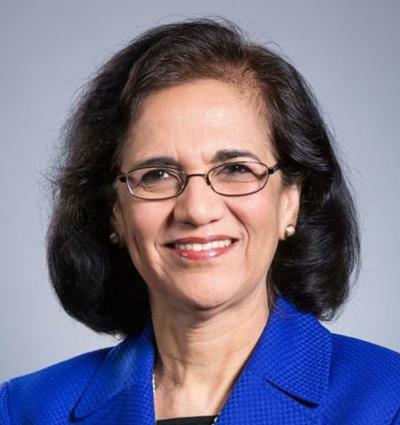 In addition to serving as RSNA president, Rao is chair of the department of radiology at Thomas Jefferson University. "I think we have a lot of work to do at our own institutions to start with," Rao said. "I can tell you that at my institution, the associate deans were telling medical students not to go into radiology because there will be no jobs. The hype [about AI] is creating so much fear." Rao also charged that high-profile venture capitalists are making sweeping statements about radiology becoming obsolete in the future with the imminent ubiquity of AI, and that such declarations are influencing academic settings. RSNA President Dr. Vijay Rao. A case in point is venture capitalist Vinod Khosla of Khosla Ventures, who said in a podcast in 2017 that the role of the radiologist will be obsolete in five years because, in his belief, sophisticated algorithms would become superior to radiologists for detecting pathologies in medical images. "This is 2018," Rao countered. "I don't think we are going away in four years." Rao believes that radiology thought leaders need to spread the word about how AI will benefit radiology, both at their own institutions and at societies. These messages need to reach clinical radiologists, residents, and medical students, she said. "We have to explain that we will not lose our jobs and that [AI] will help us to improve our workflow," Rao said. "We will be able to do more meaningful work [when AI is integrated into radiology]. We can go talk to patients, so patients understand that radiologists are doctors." Radiologists have historically been early adopters of new technologies in medicine, and adapting to AI is really no different, she contended. "Every decade, some technology has come around that has revolutionized our field," Rao said. "The next frontier innovation that will revolutionize radiology is deep learning and machine learning." The amount of medical imaging data is exploding, with 2 trillion images produced annually all over the world. Some 50% of these images are generated in the U.S., leaving radiologists overwhelmed with the number of images requiring interpretation -- and this doesn't even include reviewing the clinical records of patients, Rao noted. "No wonder we are dealing with burnout of radiologists; so I would say AI is a friend and not a foe," she said. Professional organizations such as the RSNA are spearheading a number of initiatives in response to the astounding growth of AI in radiology, such as an online course the group is sponsoring with the Society for Imaging Informatics in Medicine (SIIM) that teaches the basics of deep learning. In addition, the RSNA is co-sponsoring an invitational consensus workshop at the U.S. National Institute of Biomedical Imaging and Bioengineering on AI in medical imaging, to be held late in the summer of 2018. The society is also launching a new online journal, Radiology: Artificial Intelligence, in 2019. For its part, CAR, the national voice of radiology in Canada, has acknowledged the growth of AI in medicine and radiology specifically, publishing an open-access white paper on AI in the May 2018 issue of the Canadian Association of Radiologists Journal (Vol. 69:2, pp.120-135). The organization has also created a working group with a mandate to discuss and deliberate on practice, policy, and patient care issues related to the introduction and implementation of AI in imaging. "It is anticipated that the implementation of AI in radiology over the next decade will significantly improve the quality, value, and depth of radiology's contribution to patient care and population health, and will revolutionize radiologists' workflows," wrote multiple authors in the white paper. CAR is the first medical specialty organization in Canada to organize its annual meeting with AI as its theme, and it described CAR 2018 as one step on the road to shaping the future of AI in Canadian radiology, according to Dr. Emil Lee, president of the group. "[Artificial intelligence] is seen as a potential revolutionary influence in just about every human endeavor," Lee told meeting attendees. "Nowhere is that potential larger than in healthcare. What better way to underline radiology's pivotal role in healthcare than to learn about the relationship between AI and radiology and how best we can move together into the future."